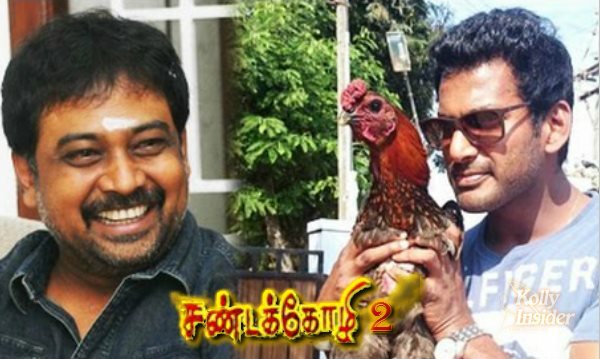 Director Lingusamy has completed the script for his next film with Vishal, which is said to be a sequel to Sandakozhi. Sandai Kozhi is a film which was a turning point in Vishal’s career. This film which was directed by Lingusamy had Vishal, Meera Jasmine and Raj Kiran in the cast. This film which was released in the year 2005 turned out to be a great hit. After this film, Vishal started acting in action oriented films. After the film was completed, there were some difference of opinions between Vishal family who produced the film and director Lingusamy. Both of them were not in talking terms. Few months ago Vishal and Lingusamy decided to join hands once again. Vishal who tried to forget the past wanted to help director Lingusamy who was struggling after the flop of Anjaan. Lingusamy has to now give a hit film to sustain him. Talks were held and it was decided to make Sandai Kozhi 2. It was announced that the shooting of this film will commence on 1st May. Lingusamy after completing this film will be directing a film which will have Karthi in the lead role. Sandakozhi 2 is expected to be an action-packed film. Says a source, "The search for the female lead is currently on and once the other cast is finalized the shoot will begin on May 1 as per the plan. Meanwhile, Vishal will complete his upcoming film directed by Suseendhiran, opposite Kajal Aggarwal." Will Sandakozhi 2 be the continuation of the earlier film? Let's wait for it. But this is definitely exciting !